Includes practical aspects of destructive and non-destructive testing of structural elements/construction materials such as hardened concrete, steel, wood, and masonry. It has several testing machines to characterize the mechanical properties of these materials. The lab also provides facilities for testing aggregate, cement, admixtures, additive materials and fresh concrete, as well as for testing of structural components and assemblies (under static and dynamic loads) including beams, columns, slabs, trusses. The lab also includes an Environmental Chamber to carry out shrinkage and creep tests under controlled humidity and temperature. Covers practical aspects of testing and assessing mechanical properties of soils. It covers applications of testing principles to measure fundamental aspects of soil behavior, ranging from classification to engineering properties. Main tests conducted as a part of the laboratory include: description and identification of soils (visual manual procedure); determining the moisture content of soil (convention and microwave oven methods); determining the specific gravity of soil; determining the liquid limit, plastic limit and plasticity index of soil; grain size analysis of soil; and more. Urban and Coastal Water System Laboratory, consisting of fluid mechanics lab and hydro-environmental informatics lab, is dedicated to addressing water resources engineering challenges through fundamental and applied research taking the advantage of our advanced lab, field, and computational facilities. 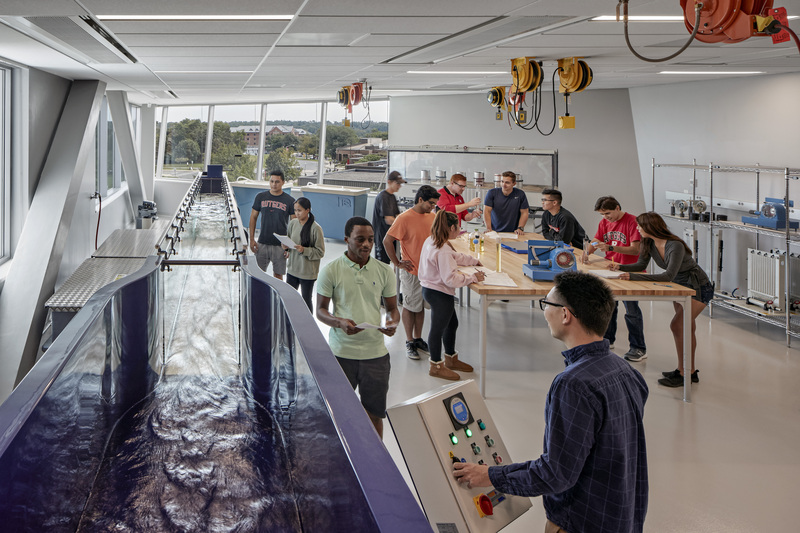 The Fluid Mechanics Lab is equipped with a hydraulic, wave, and sediment flume, hydrology apparatus, volumetric hydraulic benches with a variety of experimental modules, various field flow and water quality monitoring devices, and a stormwater green infrastructure testing platform. The Hydro-environment Informatics Lab houses environmental modeling and informatics facilities with access to the leading-edge computational clusters, a real-time environment monitoring center, and a sensor fabrication space with testing equipment. Please direct questions about the laboratory and potential collaborations to Dr. George Guo (Fluids Lab) at qguo@rutgers.edu or Dr. Roger Wang (Hydro-environment Informatics Lab) at rq.wang@rutgers.edu. The Environmental Engineering research labs are located in the Week Hall 319 and 323. The facility has a full array of tools and instrumentation for sampling, simulating, and analyzing environmental matrices and unit processes. 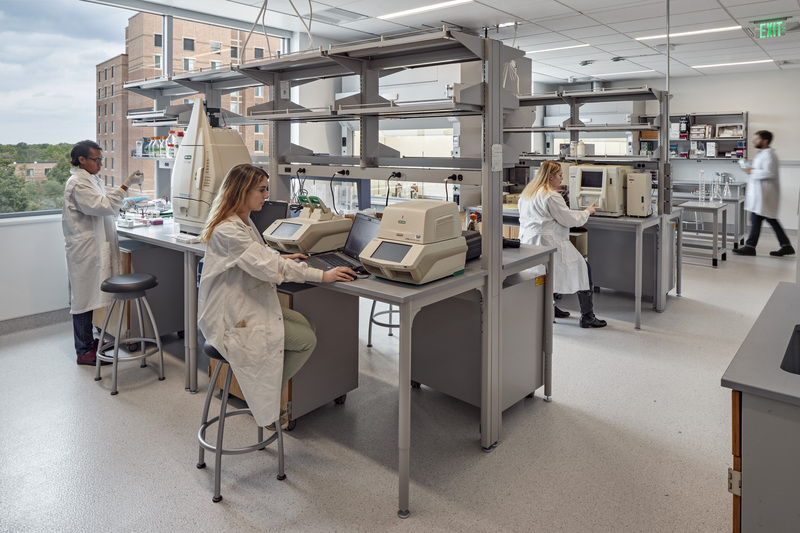 Applied environmental chemistry instrumentation includes liquid chromatography (HPLC), total organic carbon and nitrogen analyses, and a variety of field meters and spectrophotometers. Applied environmental microbiology instrumentation includes PCR and qPCR thermocyclers and a fluorescent microscope. Tools for cultivating microbes include an anaerobic chamber, laminar flow hoods, shaking and walk-in incubators, and an annular biofilm reactor. Please direct questions about the laboratory and potential collaborations to Nicole Fahrenfeld, PhD at nfahrenf@rutgers.edu.